Hello everyone! Today is the 14th of the month and this date marks the release of new card kit from Simon Says Stamp. This particular kit, October one, is probably my most favorite one this year. I really like the stamp set included in the kit, I think its such a well thought out set, ideal for many things like pattern stamping, wreath stamping etc. I made several simple, almost one layer cards and filmed a video tutorial for one of them. Keep on reading to learn more! Like these cards? Pin them! All three cards I’m sharing today use the same stamp set, Nutty Over You, plus same colors of ink. I haven’t made card sets in a long time, so I decided to stamp several cards today. 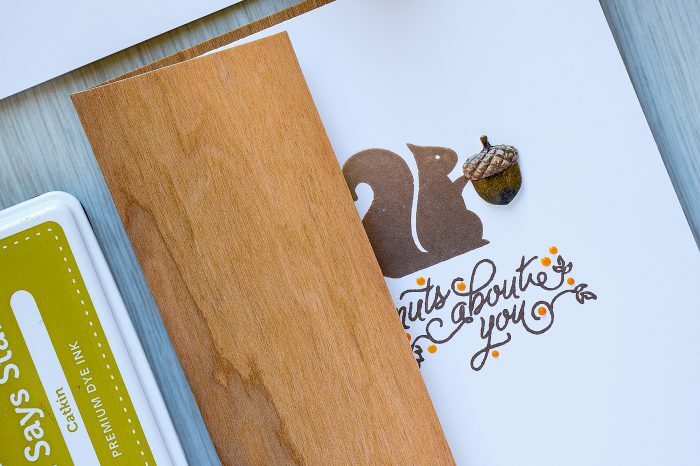 The “star” of each card is a little 3D acorn sticker from Little B included in this month kit. I simply adore stickers from Little B as they are always very high quality and look oh so real! 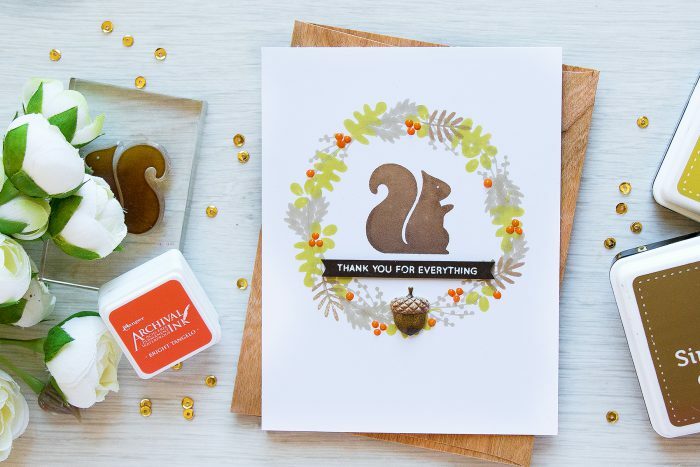 The “Thank You For Everything” card features a hand stamped wreath with little dimensional berries in orange created using Nuvo Ripened Pumpkin Crystal Drops. I first wanted to stamp red berries, but as soon as you add red to any wreath it begins to look like a holiday one (see this post for example), so I opted for orange instead. 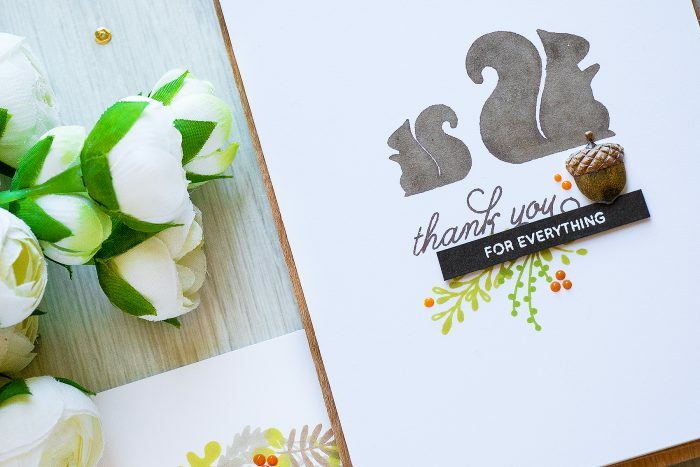 My second project features the same sentiment, but this time the “Thank You” was stamped in different font, I love combining two fonts for sentiments, its always a win. I also paired these cards with Simon’s Woodpaper envelopes – I think they add fantastic touch. 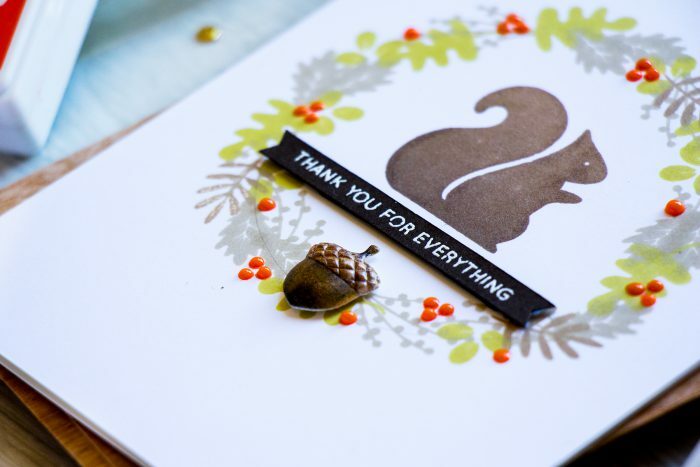 There’s a lot of brown on this project, the tiny orange dots make the card a bit more vibrant cheerful and the acorn sticker adds a fun little dimensional touch. The last card “Nuts About You” is the most simple out of all three. 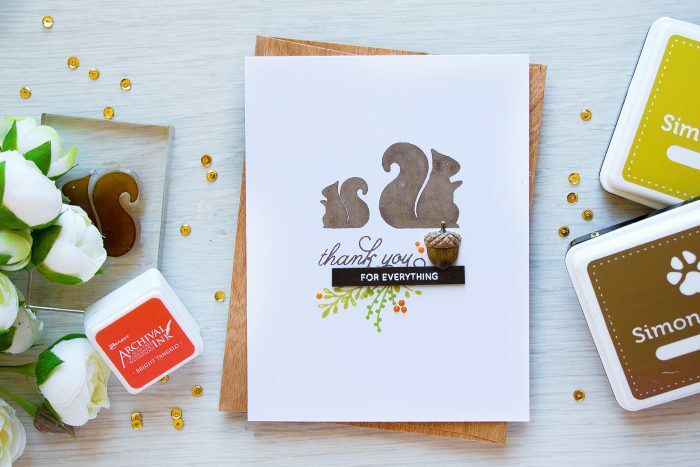 I only stamped a squirrel, a sentiment, added orange berries and the acorn sticker and called it a day! Again, I paired this with wood paper envelope for a more professional look. Oh my.. these cards are fantastic! Love one later approach. So stylish and cool! Gorgeous cards. Love the CAS feel of these. These are all lovely cards Yana, a fantastic job on them! Very cute! I cant wait to get my set.